Any registered owner of Script Werx may purchase an additional year of downloads for $39 (for a site license, 20 percent of the current price). 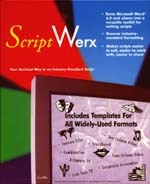 This license extension gives you access to the current release of Script Werx (note that no additional upgrades will be made to Script Werx, this means that it will not be updated to work with Microsoft Word 2007 [Vista] or future version of Word for Macintosh). Downloads are made from a password-protected download page on this Web site. You can extend your single-copy Script Werx license either online or by phone 1 (888) 627-8812. Single-copy license extension orders are processed by Screen Style. To extend a site license, please contact Parnassus Software directly, at (818) 952-8102. Your initial purchase of Script Werx entitles you to no-additional-cost downloads for a period of 12 months following your date of purchase (if you registered your purchase, which is done automatically for online purchase and downloads). If you are still within that time period, just contact us by email or phone, (818) 952-8102, for the current password, which is changed monthly. Cell Breaking tool upgraded to work with scripts that include section breaks and/or manual page breaks (script is broken into multiple tables). Time Tool upgraded to work with scripts that are over an hour in length and/or include section breaks and/or manual page breaks (script is broken into multiple tables). Shot Numbering Tool upgraded to better tolerate multiple styles in the same table cell and empty paragraphs. Storyboard and reports (prompter, shot list and scene list) upgraded to work with scripts that include section breaks and/or manual page breaks (script is broken into multiple tables). On Windows, In dialog boxes for Preferences and Cell breaking, fixed text boxes that could turn black and unreadable in some situations. For four-column scripts, further bullet-proof Shot Number tool to be more tolerant of non-standard entries in visual column. V11.1 Upgrade Posted 3/17/05 for Windows, 4/26/05 for Macintosh. Bug corrected that caused character cues followed by the TV format indication for dialog continuing after action, (COND'T), to be deleted when using the Repaginate tool from the Script Werx menu. Feature that automatically identifies continuing dialogue (when that dialogue is interrupted by action description) made an option and added to the Combination format (previously available only on screenplay formats). More attractive title format on the title page of a corporate screenplay format. Once names are added to the Character Toolbar, when starting a new script, you are given the option of creating a clone template, so that character names are retained on the existing template and you have a new template, with a blank Character Toolbar, to use for your new script. The procedure for importing existing screenplays no longer chokes if the "smart cut and paste" option is selected, and an unlimited number of character names can be entered during the import procedure (previously limited to a total of 256 spaces and letters). Character names are now archived in a file named Character List.txt, which is saved in the same folder as the destination (new) script and can be viewed and edited by the writer. Also for importing screenplays, a key combination is added to the Import Script dialog box, making it easier to enter character names from the script being imported. The Often-Used Words tool further bullet-proofed to prevent assigning a single key to an AutoCorrect entry, which would prevent using that key for typing a single letter (any time the key was pressed, an entire phrase would be typed out, rather than the single character). For all formats—Out Takes tool to archive deleted text in a separate document. For script formats—Capacity of the Character Toolbar increased to twenty names, up from twelve. For screenplay formats—Fudge tool to easily adjust the margins of one paragraph to bring up words straggling onto a last line. Also for screenplay formats—Automatic marking of continuing dialogue, when a character's dialogue is interrupted by action. Fixes problems with keyboard shortcuts on screenplay formats for displaying dialog boxes used to add scene headings. In addition to upgrading for Microsoft Word 2003 on Windows, version 10 is a major reworking of Script Werx. Many features have been refined, additional features have been added and Script Werx is now more reliable, and more tolerant of different working styles and levels of computer literacy than ever before. The video formats now allow the marking and sorting of time codes, and use of scene headings. Screenplay formats offer an option for indicating "continuing" dialogue, which is now automatically grouped with an existing parenthetical direction. Storyboard options have been expanded and there is now a one-click means of resizing storyboard frames.